Footprint of Buddha with Dharmacakra and Triratna, 1st century, Gandhāra. Buddha footprint at entrance of the Seema Malaka temple. The footprint of the Buddha (Buddhapada in Sanskrit, bussokuseki (仏足石) in Japanese) is an imprint of Gautama Buddha's one or both feet. There are two forms: natural, as found in stone or rock, and those made artificially. Many of the "natural" ones, of course, are acknowledged not to be actual footprints of the Buddha, but replicas or representations of them, which can be considered cetiya (Buddhist relics) and also an early aniconic and symbolic representation of the Buddha. The footprints of Buddha are along the path from aniconic to iconic which starts at symbols like the wheel and moves to statues of Buddha. These footprints are meant to remind that Buddha was present on earth and left a spiritual ‘path’ to be followed. They are special as they are the only monuments which give Buddha a physical presence on earth as they are actual depression in the earth. A depression atop of Adam's Peak in Sri Lanka is among the largest and most famous footprints. The footprints of the Buddha abound throughout Asia, dating from various periods. Japanese author Motoji Niwa (丹羽基二, Niwa Motoji), who spent years tracking down the footprints in many Asian countries, estimates that he found more than 3,000 such footprints, among them about 300 in Japan and more than 1,000 in Sri Lanka. They often bear distinguishing marks, such as a Dharmachakra at the centre of the sole, or the 32, 108 or 132 auspicious signs of the Buddha, engraved or painted on the sole. Buddhist legend holds that during his lifetime the Buddha flew to Sri Lanka and left his footprint on Adam's Peak to indicate the importance of Sri Lanka as the perpetuator of his teachings, and also left footprints in all lands where his teachings would be acknowledged. In Thailand, the most important of these "natural" footprints imbedded in rock is at Phra Phutthabat in Central Thailand. In China, during Tang Dynasty, the discovery of a large footprint of the Buddha in Chengzhou caused Empress Wu Zetian to inaugurate a new reign name in that year, 701 CE, starting the Dazu (Big Foot) era. The footprint as a sculptural object has a long history stemming from the first examples made in India. These were made during the pre-Greco-Buddhist phase of Buddhist art at Sanchi, Bharhut, and other places in India, along with the Bo-Tree and the Dharmachakra. Later, the footprint-making tradition became prominent in Sri Lanka, Burma, and Thailand. The veneration of the feet of gurus or deities were commonplace in ancient India, placing one's head at or under their feet being a ritual gesture declaring a hierarchy. As cetiya, the Buddha's footprint was classified in a variety of ways. Some were uddesika, representational relics, and others were paribhogika, relics of use or of contact, and occasionally saririka, as though they were not just footprints but the Buddha's actual feet. Some of the depictions of the footprints may signify events in the life of the Buddha, but others may have been depictions of people worshipping at footprint shrines. To clarify: a footprint of the Buddha is a concave image of his foot (or feet), supposed to have been left by him on earth to purposefully mark his passage over a particular spot. The images of the Buddha’s feet are convex images which represent the actual soles of his feet, with all their characteristics. Following the traditional triple division of the cetiya, we can assume that the first form of the image of the Buddha’s feet – the concave one – is a sort of pāribhogika element, since it is indissolubly connected with the Tathāgata himself. 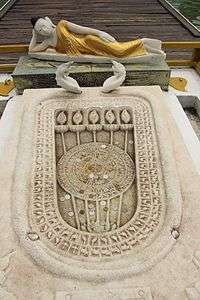 The second one can be thought as an uddissaka element, since it has been created by a devoted artist (or artists) to commemorate the Buddha, taking as its model a genuine footprint. But we can think of this second group, too, as a “pāribhogika by supposition”, as accurately noted by Chutiwongs. According to French scholar Paul Mus, the footprints were the type of magical objects which "enables one to act at a distance on people related to it." 1 2 3 Stratton, Carol (2003). Buddhist Sculpture of Northern Thailand. Serindia Publications. p. 301. ISBN 1-932476-09-1. ↑ Strong, John S. (2004). Relics of the Buddha (Buddhisms: A Princeton University Press Series). Princeton University Press. p. 87. ISBN 0-691-11764-0. 1 2 3 Strong, John S. (2004). Relics of the Buddha (Buddhisms: A Princeton University Press Series). Princeton University Press. p. 86. ISBN 0-691-11764-0. ↑ Niwa, Motoji (1992). Zusetsu sekai no bussokuseki: bussokuseki kara mita Bukkyō 図説世界の仏足石: 仏足石から見た仏教 [Buddha's footprints, pictures and explanations: Buddhism as seen through the footprints of Buddha] (in Japanese and English). Meicho Shuppan. p. 5. ISBN 4-626-01432-1. ↑ "Footprints of the Buddha". Buddha Dharma Education Association Inc. 2008. Retrieved 2008-05-11. 1 2 Stratton, Carol (2003). Buddhist Sculpture of Northern Thailand. Serindia Publications. p. 302. ISBN 1-932476-09-1. 1 2 Strong, John S. (2004). Relics of the Buddha (Buddhisms: A Princeton University Press Series). Princeton University Press. p. 85. ISBN 0-691-11764-0. ↑ "A "Buddhapada" stone, 1st / 2nd c. CE, Gandhara: Commentary by John Eskenazi Ltd.". Columbia University. Retrieved 2008-05-10. ↑ Cicuzza, Claudio, A Mirror Reflecting the Entire World. The Pāli Buddhapādamaṅgala or “Auspicious signs on the Buddha’s feet”. Critical edition with English Translation, Materials for the Study of the Tripiṭaka, vol. VI, Lumbini International Research Institute, Bangkok and Lumbini 2011, p. xxi. ↑ For the late triple division of the cetiya, see for example Pj 8.7 (PTS 222): taṃ panetaṃ cetiyaṃ tividhaṃ hoti paribhogacetiyaṃ, uddissakacetiyaṃ, dhātukacetiyanti. tattha bodhirukkho paribhogacetiyaṃ, buddhapaṭimā uddissakacetiyaṃ, dhātugabbhathūpā sadhātukā dhātukacetiyaṃ. See also Ja 479 (PTS IV, 228) and Kassapadasabalassa suvaṇṇacetiyavatthu in Dhp-a 14.9 (PTS III, 251). ↑ See Nandana Chutiwongs, “The Buddha’s Footprints”, Ancient Ceylon 10 (1990), p. 60. ↑ Mus, Paul (2002). Barabudur (Indira Gandhi National Centre for the Arts). Alexander McDonald (trans.). Sterling Publishers, India. p. 67. ISBN 81-207-1784-8.